> MineralTree > Are You Running Your Business with Antiquated AP? A Guide to solutions that make AP simpler, safer, and more efficient. Everyday AP is an arduous process. It involves receiving and manually keying data from paper invoices, chasing approvals through e-mail and phone calls, printing paper checks to pay vendors, manually collating checks with printed invoices and purchase orders, tracking down CFOs for signatures, stuffing envelopes, applying postage, and finally, delivering the resulting stack of payments to the local post office. 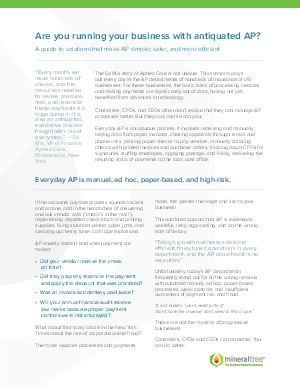 Controllers, CFOs, and CEOs often don’t realize that they can manage AP processes better. But they can; and so can you.